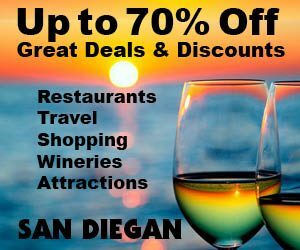 SAN DIEGAN, The Original City Guide since 1969! A FREE ONLINE GIFT of 224 pages of ALL ABOUT SAN DIEGO for FAMILY and FRIENDS visiting soon! With infinite detail on discovering the amazing communities and traditions of San Diego, catch up on everything you need to know about San Diego! Indexed and easy to use, it holds volumes of information to live the San Diego Adventure! COUPONS, too! READ the SAN DIEGAN by turning the pages with the red dot in the SAN DIEGAN BOOK displayed BELOW! The SAN DIEGAN is the oldest, continuously-published, city-guide book of San Diego. 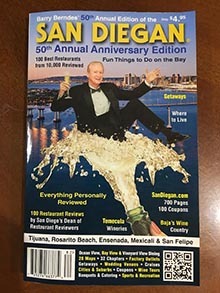 It was originally published as San Diego Guide in 1969 and changed its name to SAN DIEGAN in 1979. Barry Berndes, the publisher of the SAN DIEGAN, is a graduate of SDSU in Communications. During the Vietnam War, he served for 4 years as a Naval Officer on several ships including the USS Midway. His assignment included the role of Tour Officer requiring him to review recreational tour options to wisely allot the limited time for sailors’ R & R upon stopping in friendly ports. This sparked his interest in the travel industry. He returned home after the War and began to work on the first San Diego Guide!